Image via Hector Sanchez for Southern Living. Each year, Southern Living Magazine presents one home to the public as a sort of living Pinterest board showcasing the latest trends in design, home technology, appliances, finishes, and more. This year, Austin has been graced as the location that will be hosting the 2018 Idea House until November – and it's stunning! Located in Northwest Hills, the 2018 Idea House was revamped by designer Meredith Ellis (Meredith Ellis Design), architect Chris Sanders (Sanders Architecture), and builder David Wilkes (David Wilkes Builders). This specific idea house is only one of two renovated homes in the series that’s been around for 26 years, making it a perfect place for Austin homeowners to be inspired if they’re looking to remodel this year. A large lawn gives way to a white brick home with colonial-style charm invoked by white pillars, white shutters, and a few rocking chairs nestled between plants out front. 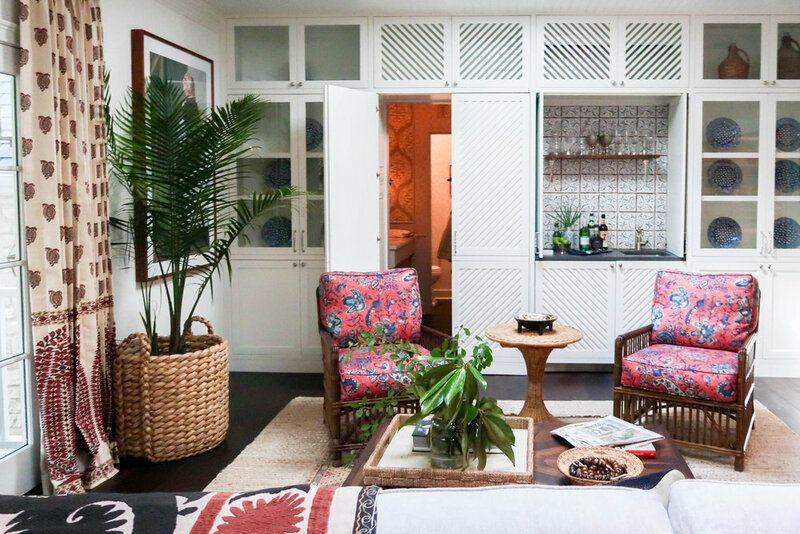 Upon entering the home, however, visitors will find the 4BR/4.5BA decorated in an eclectic manner with textiles and accessories from JAMES Showroom. Rich hues are effortlessly contrasted against stark white walls and statement finishes add a unique touch to each room. The backyard, with garden space designed by Big Red Sun Austin, seamlessly flows into a small wooded area and features a back deck and patio with enough space to entertain a large group of friends and family. Guests can visit this home (which can be purchased either furnished or unfurnished) and all ticket sales benefit the Dell Children’s Medical Center.